The F-35’s network-centric capabilities will reshape the way the ADF identifies, categorises and prosecutes actions against targets, with the F-35 as a central node in a system-of-systems. For the F-35, the aircraft's mission systems refer to the various pieces of operating software, avionics, integrated electronic sensors, displays and communications systems that not only collect and distribute data with both the pilot and other friendly aircraft, they also enable the F-35 to act as a node within a broader system-of-systems. This capability is supported by six individual components that, when used in combination with one another, enable the F-35 to enter hostile airspace, collect and disseminate complex data and targeting information, and transmit it to a range of sensor and 'shooting' units across the air, land and sea domains. Major General Carl Schaefer of the US Air Force, formerly of the Joint Strike Fighter Integration Office, said, "The F-35 brings an unprecedented sensor fusion with the radar and its optical capabilities, its data link capabilities and its radar warning receiver capabilities. It's going to be our multi-role fighter for the Air Force and provide close-air support missions, offensive counter air, defensive counter air, suppression of enemy air defences and the destruction of enemy air defences." Active electronically scanned array (AESA) radar: The F-35's Northrop Grumman-designed AN/APG-81 AESA radar enables pilots to effectively engage air and ground targets at long range, while supporting improved situational awareness. The solid-state technology and elimination of mechanical moving parts enable the AESA radar to surpass current standards for systems reliability. Meanwhile, the radar system also features a "replaceable assemblies" design for faster, easier repairs or upgrades to hardware and software modules. For these reasons, AESA life-cycle costs are expected to be significantly lower than those of MSAs. The active arrays on the F-35 should have almost twice the expected life of the physical airframe. 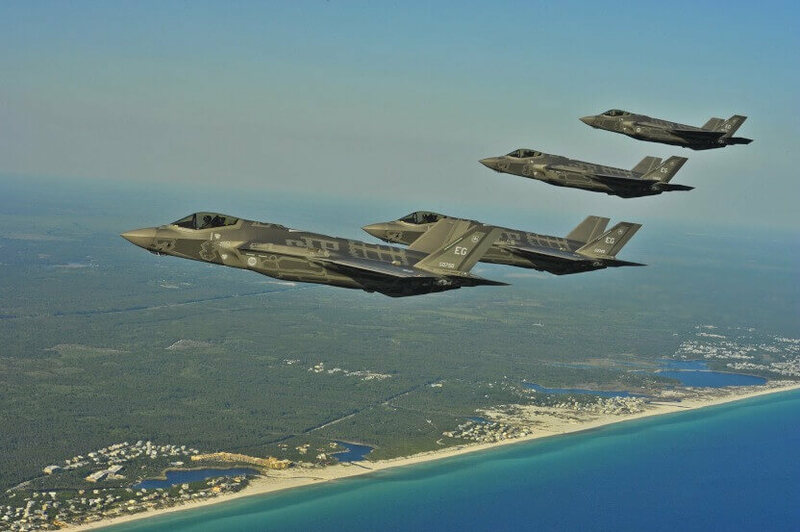 Distributed aperture system (DAS): Also designed by Northrop Grumman, the AN/AAS-37 electro-optical DAS provides the F-35 with a 360-degree, spherical situational awareness system. This gives the pilot high resolution, real-time imagery to their helmet from six infrared cameras mounted around the body of the aircraft, allowing the pilot to see the environment around them, day or night. Additionally, the DAS is integrated as part of the broader systems, enabling the aircraft to analyse threats and alert the pilot. In the case of multiple threats, DAS is able to identify the highest value targets and recommend the order in which to deal with each threat. This 'data fusion' affords F-35 pilots with a significant advantage over adversaries by simplifying, analysing and managing complex information for the pilot, who must quickly evaluate a complex range of options in a hostile, tactical air combat environment. Precision tracking of wingmen/friendly aircraft for tactical manoeuvring. Electro-optical targeting system (EOTS): Designed and manufactured by Lockheed Martin, the F-35's EOTS is the world's first and only sensor to combine forward-looking infrared (FLIR) and infrared search and track (IRST) capability. F-35's EOTS is designed to maintain the airframe's low observability profiling and ensure aerodynamic performance. The high-performance, lightweight, multi-function system enhances F-35 pilots’ situational awareness and provides precision air-to-air and air-to-surface targeting capabilities, supporting the aircraft's role as a 'strike' fighter. Communications, navigation and identification (CNI) avionics system: The integrated CNI system is developed by Northrop Grumman and provides F-35 pilots with the capability of more than 27 separate avionics functions. The CNI system utilises software-defined radio technology and allows for simultaneous operation of multiple critical functions, such as identification friend or foe, precision navigation, and various voice and data communications, while greatly reducing size, weight and power demands. Helmet mounted display systems: Supports the delivery of key data and sensor information to the pilot, enabling the pilot to see airspeed, heading, altitude, targeting information and warnings, all projected on the helmet’s visor, rather than on a traditional heads-up display on the canopy widescreen. The real-time imagery provided by the DAS enables the pilot to 'look through' the aircraft, allowing the pilot to see the entire environment around the aircraft. Additionally, the helmet provides pilots with infrared night vision through the use of an integrated camera, making images in total darkness look exactly like what they would see in daylight. The ability to transmit both complex intelligence, surveillance and reconnaissance data and targeting information enables Army, Navy and other Air Force assets for appropriate tasking by a 'shooter' platform. This 'node' capability is described best by Commander Air Combat Group, Air Commodore Mike Kitcher, who told Defence Connect, "Integrating the F-35 goes beyond just the pilot and aircrew training across the technology, it involves integrating the F-35 with the Air Force's other key platforms like the E-7A Wedgetails, our Super Hornets and Growlers and KC-30As. Furthermore, it includes integrating the aircraft into systems like the Poseidon and the Triton, which is where we start to see a web of systems created." This is reinforced by Major General Gus McLachlan, Commander Forces Command, who described the role of the F-35 as part of the broader 'joint force' ADF from an Army perspective, saying, "It is Army's response to the ADF's journey to develop an internet of things (IoT) approach to data gathering nodes across the services, like Navy's AWDs and Air Force's F-35s, and then Army being able to provide a shooting solution, should it be required." The F-35 and its diverse range of capabilities will radically change the options available to Australia's strategic decision makers, enabling a tailored, adaptable and high-capability response to a variety of threats, well into the 2040s. PODCAST: Realising the benefits of veterans in the... - 11 hours ago.